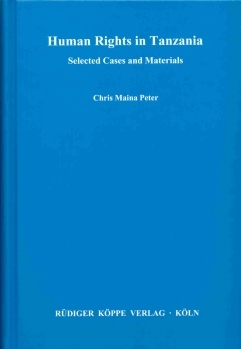 Author: Chris Maina Peter. With a preface by: Robert Habesh Kisanga. 34 pp. Roman, 894 pp. The present monograph is basically an academic work but with a practical touch. Combining both municipal and international approaches to human rights it concentrates on the national level. Following an introductory on human rights in Tanzania, the author deals with specific articles on rights or freedoms and concludes them with a commentary. Each of these is followed by selected cases which wholly or partly deal with the particular right or freedom. References to the international dimension of a particular right or freedom and on its position in Tanzania have been made where possible.